Meet Our Ambassadors: Kwaku T.
Amfest Expo is only a week away, and as a result we are doing a showcase of the ambassadors to the event. 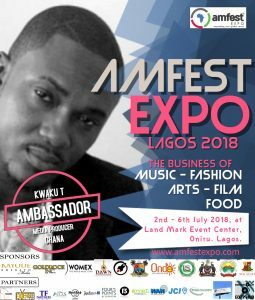 The ambassadors are internationally known creatives and entertainers based within and outside Africa. We are proud to showcase them as our ambassadors. And we start off by introducing one of Ghana’s most popular faces in entertainment and showbiz. Kwaku Asamoah. Tutu (stage name, Kwaku-T ) is one of Ghana’s leading hip hop artists. He is an internationally known media producer, entertainer and TV show host. He was the Ghanaian representative in the popular show, Big Brother Africa season II in 2007, and he has shared stages with stars like Monica, Lil Jon and Keith Sweat. In 2010, he represented Ghana in the BET Hip Hop Awards cypher.